Value in my Own Backyard – Allegheny Valley Bancorp and Standard Financial Corp.
On Monday, two Pittsburgh banks announced they would combine in a merger of equals. Allegheny Valley Bancorp (AVLY) and Standard Financial Corp. (STND) each have long histories in the city and the surrounding region. Allegheny Valley Bank was founded in 1900 as an alternative to local banks controlled by industrial titans like the Mellon family. The bank stood firm through the Great Depression and the steel industry collapse that rocked Pittsburgh in the later 20th century. Standard Bank is equally venerable, founded in 1913. While Allegheny Valley focused on urban Pittsburgh, Standard Bank grew its base in the suburbs and small cities to Pittsburgh’s east, eventually expanding into Western Maryland. Originally a mutual bank, Standard demutualized in 2010. Following the merger, the surviving entity will be named Standard AVB Financial Corp. I have followed these banks for some time, observing the business practices of each. Both are well-run, if somewhat unremarkable. For its part, Allegheny Valley has focused on maintaining a conservative balance sheet and paying a robust dividend, while Standard has followed the optimal post-mutual conversion playbook of repurchasing shares and increasing its dividend over time. Still, each bank suffers from the problems facing most small banks: sub-par ROEs from compressed interest spreads and rising compliance costs, and a lack of growth caused by low loan demand and insufficient marketing and technology resources. I believe the proposed merger will do much to alleviate these headwinds, leaving shareholders in the combined entity extremely pleased. At present, each bank is only a blip on the local financial radar. 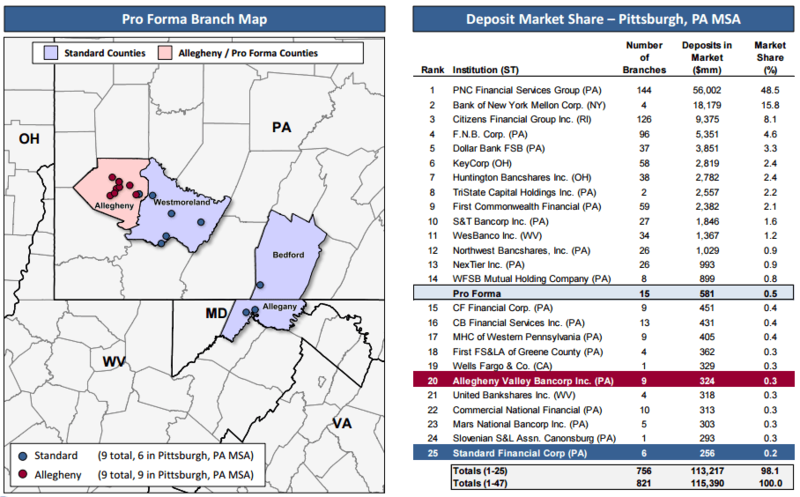 Allegheny Valley has a deposit market share of just 0.3% in the Pittsburgh MSA, while Standard’s Pennsylvania operations have just 0.2%. The combined entity will control 0.5%. Still small, but sufficient to vault the combined entity to 15th place among local banks from the current 20th and 25th positions. A higher market share will benefit the combined bank via improved marketing efficiencies and better geographic coverage. Standard AVB will blanket Allegheny County and adjacent Westmoreland County rather than one or the other. I am always skeptical of projected cost savings in mergers, but bank mergers typically do realize substantial savings. Many duplicated functions can be reduced or eliminated when similar banks combine. Allegheny Valley and Standard are projecting a 16% reduction in non-interest expenses, which comes to $3.5 million pre-tax on a trailing twelve month basis. Presently, Allegheny Valley Bancorp is over-capitalized and Standard Financial Corp. is highly over-capitalized. Allegheny Valley’s common equity-to-assets ratio is 11.8% while Standard’s is 15.1%. The combined entity will have a 13.6% equity ratio. This strong capitalization will allow for a better return on equity than Standard currently manages, plus greater capacity for growth investments and/or acquisitions than Allegheny Valley’s balance sheet allows at present. The proposed merger also strengthens and diversifies the banks’ loan books and deposit bases. Standard’s loan book is dominated by traditional residential real estate lending, while Allegheny Valley is much more involved in commercial lending. Standard relies heavily on CDs and traditional savings accounts, while Allegheny Valley has a much higher percentage of lower-cost (but potentially transient) demand accounts. Allegheny Valley Bancorp shareholders are to receive 2.083 shares of standard per AVB share, or 46% of the resulting business. The surviving entity will have 4.78 million fully-diluted shares outstanding. The combined bank is projected to have equity capital of $128.5 million at the end of the first quarter of 2017. Standard’s shares have traded down meaningfully following the merger announcement. I suspect this is because a large number of Standard’s shareholders had expected and desired a buyout by a larger bank, as is common for a recently converted mutual thrift. These shareholders may be displeased at the prospect of Standard remaining independent, even as part of a larger, more efficient organization. Standard’s shares closed at $23.80 on Thursday, down 8% since the merger was announced. But this decline only highlights the prospective value. Pro forma book value following the merger is $26.88, putting shares of Standard at 89% of book value. Earnings will take a temporary hit due to severance and restructuring charges, but forward earnings power will benefit from cost savings. Assuming the stated cost savings projections are met and a 40% tax rate, the combined entity’s annual earnings should increase by $2.1 million, or 44 cents per share. That benefit plus each bank’s trailing earnings would put earnings per share at $1.92 for a pro forma trailing P/E of 12.4. And again, this is for a bank with a very “lazy” balance sheet. Standard AVB Financial has a clear path to earnings growth through balance sheet expansion. The combined bank could expand its asset base by 60% and still maintain an 8% common equity to assets ratio. While I think shares of either bank are attractive considering the proposed combination, shares of Allegheny Valley are priced at a 2.7% discount to the deal value. (The discount is actually larger once Allegheny Valley’s generous dividend is factored in.) I like both the current discount to book value, the solid earnings yield, and the strong prospects for earnings growth. For anyone interested in beginning due diligence, here’s a direct link to the merger presentation. There is one more interesting wrinkle. Another Western Pennsylvania Bank, S&T Bancorp, owns 14.2% of Allegheny Valley’s shares. S&T will own about 6.5% of the combined bank, making S&T the largest shareholder. A future tie-up with Standard AVB Financial would solidify S&T’s status as a top 10 bank by deposit share in the Pittsburgh MSA. Not saying it will happen, but S&T is acquisitive. Alluvial Capital Management, LLC holds shares of Allegheny Valley Bancorp and Standard Financial Corp. for client accounts. Alluvial may buy or sell shares of Allegheny Valley Bancorp and/or Standard Financial Corp. at any time. OTCAdventures.com is an Alluvial Capital Management, LLC publication. For information on Alluvial’s managed accounts, please see alluvialcapital.com. Alluvial Capital Management, LLC may buy or sell securities mentioned on this blog for client accounts or for the accounts of principals. For a full accounting of Alluvial’s and Alluvial personnel’s holdings in any securities mentioned, contact Alluvial Capital Management, LLC at info@alluvialcapital.com. 8 Responses to Value in my Own Backyard – Allegheny Valley Bancorp and Standard Financial Corp.
No, I am holding because I like the economics of the combined bank. AVLY is simply the slightly cheaper way to invest in it. Do you feel the management of the combined bank would lever up the balance sheet after the closing? Also, some of their local competitors (CBFV, CNAF) are having a hard time meaningfully growing loans. Is it more of execution problem or is it reflective the local economy? Finally, do you feel STND is a seller? Andrew Hasley from AVLY is 54 years old and I doubt he may be reluctant to sell the bank so soon.. In my view, higher leverage will not be created by organic loan growth. As you rightly pointed out, local competitors are facing weak loan demand. I think Standard AVB is far more likely to conduct additional acquisitions. There are several local banks that would make very attractive purchases. For example, Mars National Bancorp, ticker MNBP. Acquiring Mars would vault Standard AVB to over $900 million in deposits and nearly $1.3 billion in assets. The deal would be highly accretive. It could easily be structured as a cash and shares deal in order to allow Mars shareholders some continuing participation. Standard AVB is more likely to be a buyer than a seller in the short run, but I don’t believe Hasley would turn down a sale for the right price. I agree with you that Mars National Bancorp is a decent acquisition party. I remember that CEO of CBFV was telling me about the refinery in Pittsburgh area and the jobs the refinery is adding to the area. What are your thoughts about it? Sell AVLY and buy STND instead. Even with two quarterly dividends this is the better way. The spread is in favor of STND at the moment, but probably not after factoring in bid/ask slippage and trading expenses. Enter your email address to subscribe to OTC Adventures and receive notifications of new posts by email.